GM has filed an application to register “Change Your Perspective” as a trademark with the United States Patent and Trademark Office (USPTO), GM Authority has discovered. Earlier this month, GM revealed an electrified bicycle. Curiously, it has yet to decide on a name for product. 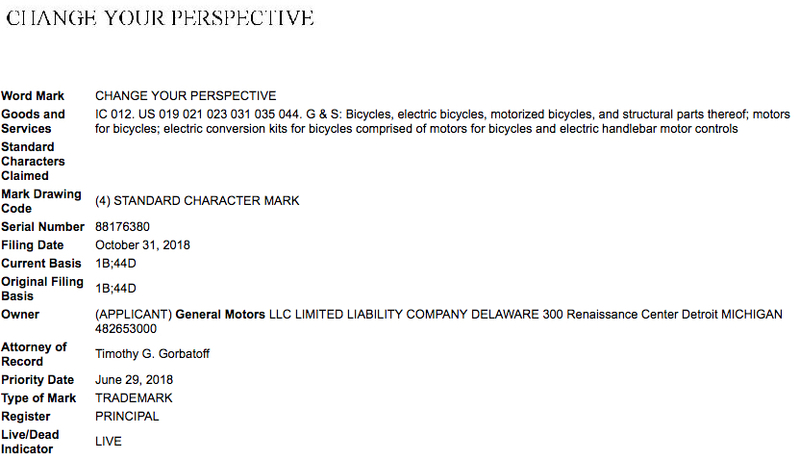 However, this filing seems to indicate that the Detroit-based automaker may have already picked out a motto/tagline for marketing the bikes. Stay tuned to GM Authority as we dig into what GM has planned for this trademark filing, as well as for more GM trademark news and GM news coverage. These electric bikes will change your perspective. Try 60mph for the Stealth. 90lb-ft for the Haibike. 50% inclines on dirt on the HPC. What a joke. If you want people to change their perception that GM is a backwards-thinking company for coming out with bicycles when their core product lineup is loosing market share, this should do the trick.